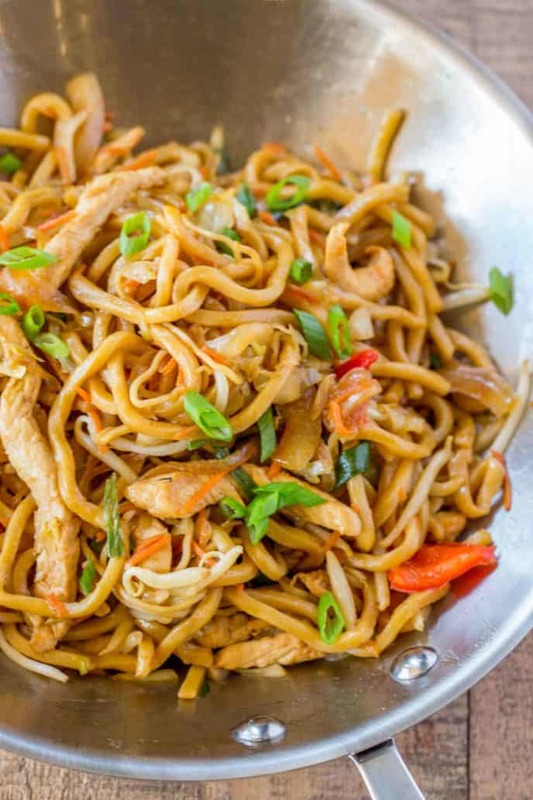 Lo Mein is a fantastic Chinese takeout option if you’re looking for something a bit thicker than the traditional Chow Mein. As a kid growing up my mom was not very well versed in making Chinese food (she once made chow mein with angel hair noodles). I wanted to know how to make lo mein like in Chinese restaurants but despite her best efforts we’d end up with were soy sauce flavored noodles with all the veggies she thought she could hide in the pot. It was a valiant effort, but it never really tasted like Chinese food from a Chinese Restaurant. Since watching my favorite Daytime talkshow make their version of The Chew chicken lo mein (I’m a huge Micheal Symon fan), I had a craving to make some lo mein. What you’re looking at is my quickly thrown together lo mein with the ingredients I had on hand and it was as delicious as my favorite takeout spot. My husband was watching along with me but he didn’t understand the difference of lo mein vs chow mein until he saw the difference in these noodles! 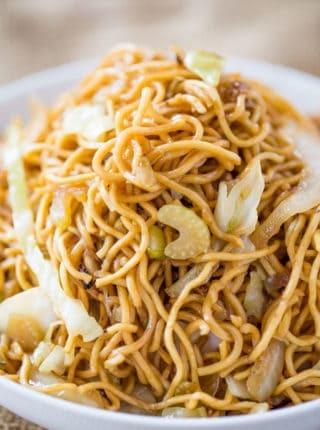 A traditional chow mein has noodles that are boiled, then stir fried until having a slightly crisped exterior while lo mein is boiled then tossed in a sauce without cooking the noodles an additional amount. The noodles are roughly the same, both egg noodles, but lo mein noodles are normally thicker and chewier. What kind of sauce is in lo mein? 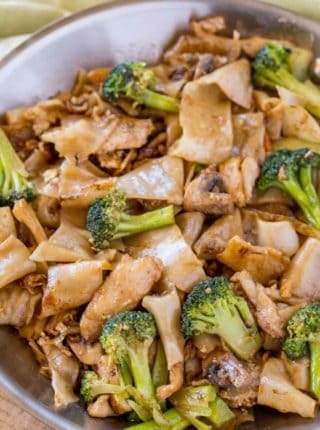 Lo Mein sauce is made with a sesame oil base that the noodles are tossed in with garlic, ginger, oyster sauce and soy sauce to round out the slightly sweet and slightly spicy sacuce. Shrimp Lo Mein: Cook the shrimp after the veggies instead of before and remove them reserving them to toss with the pasta at the end. Undercook the shrimp by about 15 seconds before cause they will keep cooking in with the pasta. Beef Lo Mein: Flank steak is the best beef for lo mein. Slice the beef against the grain and cook in on a high heat for just 30 seconds on each side. 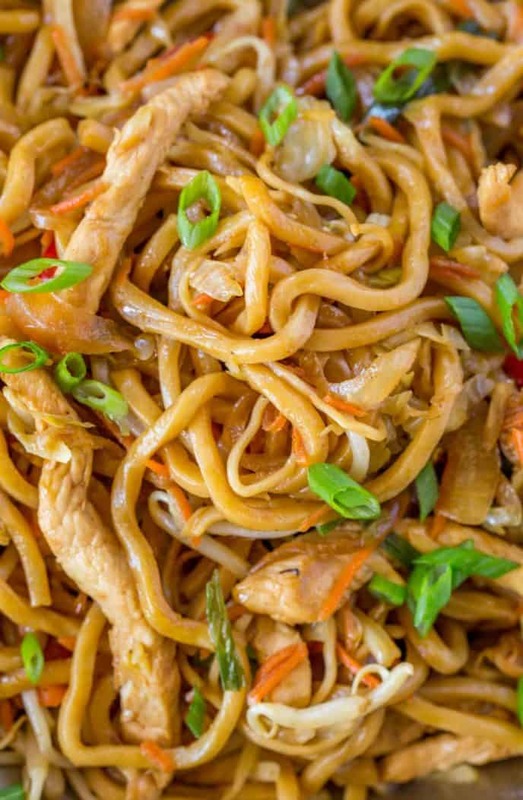 Vegetable Lo Mein: The easiest of all the varieties, add in your favorite vegetables cooked until just softened but still with a crisp bite. 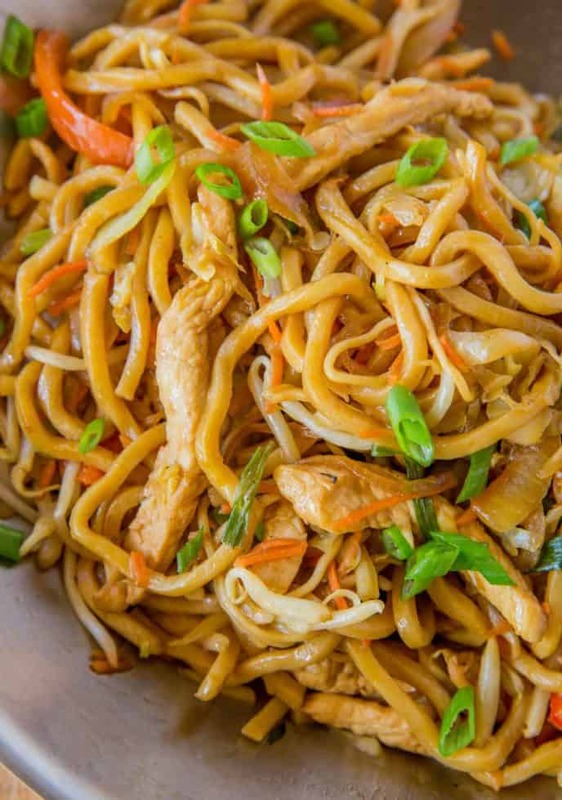 Lo Mein Noodles: Authentic and flavorful for the perfect lo mein. Cook the chicken 3-4 minutes on each side until cooked through. Remove from the pan and add in the red bell peppers, ginger and garlic and cook them for 1-2 minutes, stirring frequently until just softened. Add in the water, soy sauce, cornstarch, vegetable oil and oyster sauce into the skillet. Add in the carrot, onion and cabbage and cook for 1-2 minutes before adding back in the chicken and egg noodles. 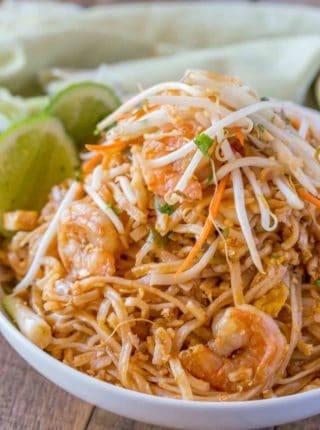 Add in the bean sprouts, toss all the ingredients together well and serve. My husband is extremely picky but we both loved this recipe! Thank you. I made this today and used thigh meat instead of the breast. My husband only likes the canned Chop Suey and Lo Mein. He ate 2 servings. It’s a keeper for us. Easy to do. I’d give it 5 stars. Am I blind or is there no amount for chicken? I’m extremely intimidated by the idea of using oyster sauce since I’m not a seafood person. How necessary is it? You can use a mushroom based oyster sauce if you don’t want a seafood based one. It tastes pretty similar! Very very good. I did add 3 th brown sugar. Made this last night. When I was cooking my husband said it smells like a Chinese restaurant. We absolutely loved it. Just like a restaurant we used to go to in Detroit. Could not find it in other restaurants as good as that one in Detroit, until this recipe. Thanks Sabrina. Yay, so glad you both loved it! I’m not sure why they would be sticky but you can always use a bit of water to help with that. As far as the sesame oil being to strong for you, you can use canola oil instead. Hope this helps! Mine was sticky too but I missed the water…oops! Still good. Do you absolutely need the cornstarch and the oyster sauce? Yes, it makes up the flavor in this dish. Leaving them out will change the texture and taste. 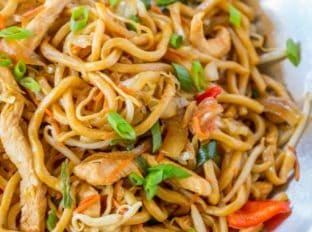 Just made the chicken lomein and it is DELICIOUS !! The sauce is soo good!!! My daughter loved it and she is picky!!! I used fresh assorted already cut up veggies. Your recipe was very easy to follow!! I will def be making this again!! YAY!!! I’m so glad you enjoyed it! We love this recipe too. I consider it a huge win when kids will eat a recipe I write so thank you for that victory today! I made this recipe tonight with a few tweaks just because of what I had/didn’t have on hand and it was delish!! Everyone enjoyed. Definitely and do-over! Where does the vegetable oil fall you call for in the ingredients? Thanks for catching that. It should be added in step 6. Enjoy! I made this and followed the directions, but my noodles keep breaking. Any suggestions? It sounds like maybe the noodles were cooked too long. Next time, try a shorter cook time. This turned out really gummy. It was almost like gravy on noodles with the cornstarch slurry. And the lo mein noodles were really over cooked. I followed the instructions on the box and took them out a minute before. Not sure where I went wrong. I just made this and it was really good but my noodles also game out kind of gummy. Although the package didn’t say it, I looked up another recipe and apparently you should rinse the Lo Mein until it is cool. Not sure if you did this, but I did not. I just drained it and add the sesame oil. So I suspect the Lo Mein just kept on cooking while I was preparing the rest. I will try rinsing my noodles the next time I make this recipe! I really hope your little guy is okay. 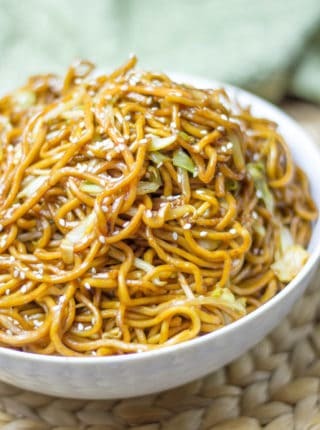 I’ve tried several lo mein recipes, and this one is by far the best! Thanks, Launi! I appreciate the 5 star rating! Very good! No more take out for lo mein. Looks good. Problem is; you can’t buy sprouts in Americans super markets any. We can’t seem to figure out how to grow them safely. Not sure what stores you have around you but I’ve been able to find them at Sprouts and Whole Foods. I didn’t have oyster sauce but I used fish sauce in its place. All 5 of my picky eaters loved it! I also used radicchio. This is a new favorite so thanks for this!! This was really good, and this recipe is definitely a keeper! But I wouldn’t say it’s like Chinese takeout. Definitely a lot of good flavors going on, but it seems to be missing that one extra zing that all takeout places seem to have in their lo mein. I wish I knew what it was. But I’d definitely make this again! Thanks for the recipe! Thank you Sabrina. It turned out wonderfully. So glad to hear it, May! The noodles are linked right above the recipe (and right here)! Hi, I am cooking tomorrow & I see that oyster sauce is required. I am allergic, do you have any suggestions for a substitute? They do make a vegetarin oyster sauce so I’m not sure if that helps eliminate the allergy, if not you can also use soy sauce or hoisin sauce as a substitute though it will change the flavor a bit. I hope you enjoy it! We LOVED this! I used what was ” in house “… chicken, carrots, arugula, bok choy, green onion, peas, cabbage and celery. It was outstanding, better than take out for sure! Thanks so much for the inspiration! Yay!! So glad you enjoyed it Peggi! I am SO pumped to make this…and 15 minutes…my soul is literally jumping for joy. This looks amazing! If I use a different kind of noodle, will it affect the taste? Thanks! It’ll change the texture but shouldn’t affect the taste. Let me know how it turns out. I would give it more stars if I could!! Absolutely delicious!!!!! Even my very picky children loved it! I felt like I was in a restaurant while eating it, I couldn’t believe I made something that delicious and authentic tasting! Thanks for the wonderful recipe! Will be making this a lot! You’ve made my day! Anytime I can get picky eaters to enjoy something I feel like I have won the lottery! Can I use canned bean sprouts or do they have to be fresh? Will it be negatively affected if I leave out the oyster sauce?? You won’t want to leave it out, sorry. There is a vegetarian “oyster” sauce you can use it that’s a concern. It’s mushroom based. Can’t wait to try this. I have all ingredients except oyster sauce.Do you know if it’s noticeable if I omit it? I hate to buy it for 1 spoonful. You really need it for this recipe, sorry. Can’t WAIT to try this but I need to get the ingredients right. Are the bean sprouts canned or fresh? I’m thinking (hoping) fresh but I’m really not sure if I can find them. Also, is it best to use Chinese cabbage or regular cabbage? Thanks for sharing this and other recipes! I used fresh bean sprouts for this recipe and either cabbage would be fine. Hello dinner! My family is going to devour this! Can’t wait to try this! The links for the sesame oil takes you to the soy sauce and I am curious about the authentic sesame oil and brand! 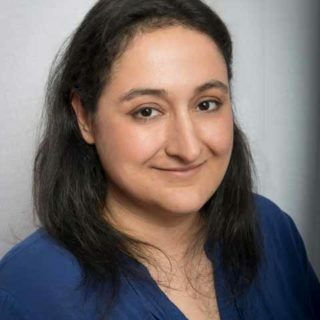 Can you link a picture of your sesame oil preference – the link attached doesn’t not connect to the item. I’ve always wanted to make authentic lo mein!! I absolutely love this recipe! It’s perfect for my hungry family! OH MY WORD! Do you think if I took out the chicken and made as directed it would still be delicious? This looks WAY better than my local chinese restaurant! Oh, definitely! You can even add in additional vegetables of your liking. Yes! I love indulgent “takeout style” dishes and homemade fast food. I’ll be making this shortly. Yes, it’s in the works. 🙂 Stay tuned! !